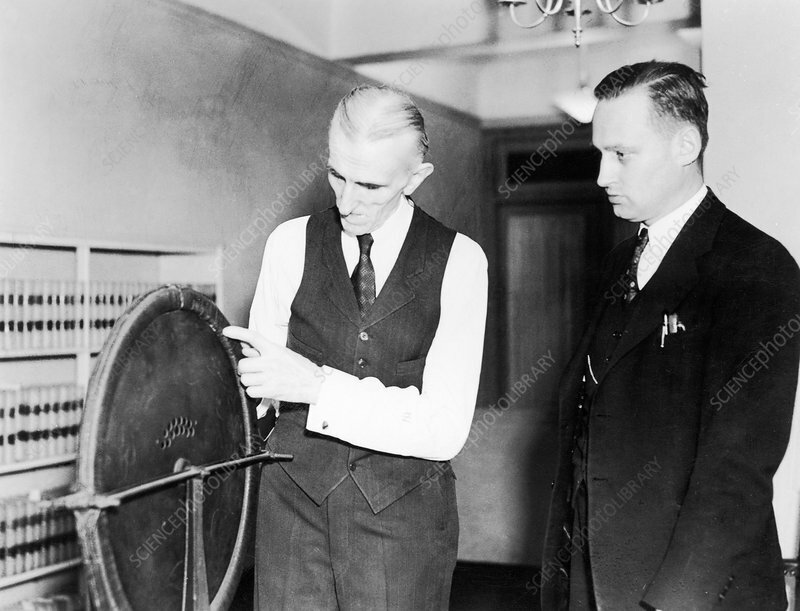 Tesla and induction motor 50th anniversary, 1938. Serb-US physicist and electrical engineer Nikola Tesla (1856-1943), standing at centre, with a representative of the Westinghouse Company. This event was held to celebrate the 50th anniversary of the invention of the induction motor. The motor shown here was made at the Westinghouse Company factory in Pittsburgh, USA, and corresponds to the model of the two-phase induction motor constructed by Nikola Tesla in Strasbourg in 1883. Tesla was educated at Graz and Prague, but in 1884 he emigrated to the USA. He made key advances in areas such as alternating current power generation and transmission. A type of transformer is named for him (the Tesla Coil), as is the SI unit of magnetic flux density.